September 15, 2012 in "cooking with Chris"
Ah Pinterest... I'm still as hooked as ever. I pin craft ideas that I will probably never tackle, images of that dream home that I will never, ever live in, and outfits that I will never be able to afford. I have no problem with Pinterest being a bit of a fantasy land, it's fun to day dream. I also pin recipes, and they seem to be the one thing that I get an actual practical use out of. I decided it might be fun to share a few of the recipes that I've pinned, tried and loved. 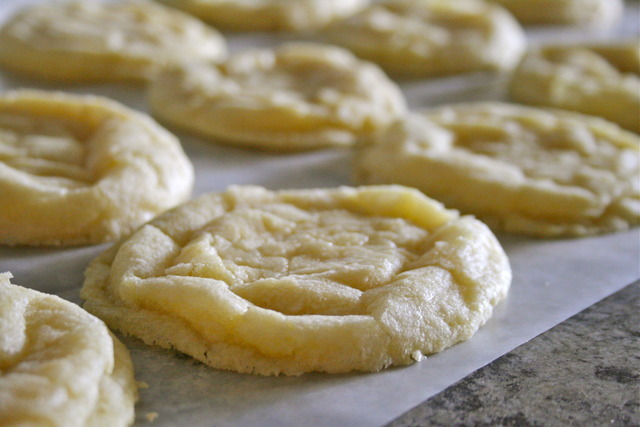 I baked these Lemon Crinkle cookies for the first time well over a year ago, and have turned to this simple and delicious recipe time and time again whenever I get the hankering for a sweet baked good. These cookies are chewy, sweet-but-not-too-sweet because of the tart lemon flavour, and really easy to make! Chances are you have most of the ingredients in your pantry already. I've made them for friends and they are always a hit. This recipe gets an A+ from me!